Nobody said panniers had to be made from cloth. In fact, Sam Lowings of Bikebins, thinks cloth panniers are not the answer, so he invented the world's first pannier made from recyclable polyethylene high-strength plastic. Bikebins are the new way to transport your laptop, clothes and groceries when bicycle commuting and are perfect for self-contained bicycle vacations, as well. Bikebins fit any standard rear pannier bike rack and protect the contents from rain, impact and theft. 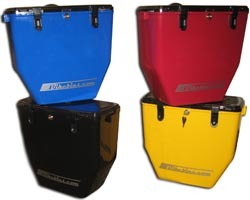 Plus, Bikebins come in four vibrant colors: black, red, yellow and blue. Bikebins are lockable, waterproof and, unlike traditional panniers, can be taken off the bike rack and set directly on the ground - with the pannier staying in place and upright, which makes getting to the contents quick and easy. Bikebins are a snap to attach and simple to take off, can be easily customized, and are competitively priced. "We are very impressed with BIkebins," says Karen Peterson of Lexco. "They are simple to use, keep everything inside safe and dry, and they come in four great colors. We believe Bikebins' quality, style and innovation offer great selling points for dealers." Says Bikebins' Mr. Lowings: "I'm delighted that Lexco will be showcasing our Bikebins to the U.S. bicycle market. Our Bins are waterproof, lockable and protective, but what's been coming back to us from our customers is much simpler: They're just so much handier than traditional cloth bags! We believe Bikebins are the future for bicycle panniers." Check out Bikebins in Lexco's free 2009 Catalog. For details, call Lexco toll-free at (800) 626-6556. In addition, Bikebins will display their product at this year's Lexco Open House on Tuesday, April 7th. About Lexco Lexco offers value-driven bicycle products and services to the marketplace. Lexco is a family-owned and operated business that began as a hardware store and Schwinn franchise on Chicago's west side in the 1950s. It continued as a Schwinn bicycle shop on the city's north side in the 60s, and in the 70s, Lexco began making bicycle security cables and has grown that into Lexco's cable division showcased at www.lexcocable.com. Lexco became a full-scale bicycle parts distributor in 1978. For more information, call toll-free (800) 626-6556. We Want to Pump You Up! With Genuine Innovation Floor Pumps. Lexco Cable Supports 2009 Academy Awards... Literally. Sure Lance is On Board, but the Bars Taste Great too! Polar Insulated Water Bottle Gone Wild!